1Department of Soil Science, Faculty of Agriculture, Ferdowsi University of Mashhad, Iran. *Corresponding author: lakzian@ferdowsi.um.ac.ir. 2Soil and Water Institute, Agricultural Research, Education and Extension Organization, Karaj, Iran. One of the biggest limiting agricultural production factors in the world is soil salinity and alkalinity. Finding a suitable and economic method to manage salinity stress is a major challenge beyond researchers. Recent studies have demonstrated that microorganisms can help plants to overcome salinity and alkalinity stress (Venkateswarlu and Shanker, 2009). Studies have shown that there is an application potential for haloalkaliphilic microorganisms and if these microorganisms have plant growth promoting haloalkalitolerant (PGPHA), it will help to cope with flooding stress, drought stress, soil salinity and alkalinity, improving plant resistance to pathogens and even more heavy metal tolerance in plants (Siddikee et al., 2011). Soil halophilic bacteria are a group of microorganisms that able to live and increase in environments with high concentration of salt and adapted to grow in such environments (Zanjirband et al., 2013). Alkaliphilic bacteria retain their internal pH of about 9.5 in the 9 to 11 external pH. These bacteria maintain their activities with the proton transfer systems in their cytoplasmic membrane (ATP pump and sodium-proton antiporter) (Horikoshi, 1999). Another group of bacteria that can grow in the presence of salt and alkaline conditions are known as haloalkaliphiles. This dual haloalkaliphilic characteristic makes them interesting for basic studies of different aspects of biotechnology (Feng et al., 2005). Many physiological processes are affected by salinity stress in plants and the most important of them are cell growth and leaf area reduction, biological yield decrease and ultimately grain yield decline. Soil salinity decreases plant establishment in the soil, as wheat seedling emergence percentage may be reduced to 50% in 8.8 dS m-1 salinity level. Soil salinity also reduces primary and secondary tillers, number of leaves in main stem and number of spikelets per spike in wheat (Asadi and Khademi, 2013). The salinity threshold at which yield begin to decline have been reported to be 8.6 dS m-1 for bread wheat. Each unit increases in soil salinity more than 10 dS m-1 at 0 to 50 cm of the soil layer, thereby causing wheat grain and straw yield reduction equal to 217 Kg ha-1 and 723 Kg ha-1, respectively (Siadat and Sadat, 1998). Study of bacterial populations in the Sambhar salt lake in India led to 93 haloalkaliphilic bacteria isolation that have optimum growth in 2-25% salt and 6-12 pH in the environment (Sahay et al., 2012). Isolates based on 16s rRNA gene sequencing were classified into 32 groups with each group representing a different taxa belonging to 3 phyla (Firmicutes, Proteobacteria and Actinobacteria). The majority of the isolates (53.12%) showed similarity with phylum Firmicutes which was followed by Proteobacteria (40.63%) and Actinobacteria (6.25%). Among Plant Growth Promoting (PGP) characteristics, ammonium producers isolates were maximum with 56% ammonium production compared with 53% ACC-deaminase producers, 50% IAA producers, 28% HCN producers, 21% siderophore producers and 34% soluble phosphorous producers. Isolates showed PGP activities and enzymatic producer characteristic, and these can be utilized for plant growth improvement in saline area (Sahay et al., 2012). Five inoculation halotolerant bacteria for improving the reduction of salinity effects (80, 160 and 320 mM sodium chloride) in wheat seedling increased 71.1% root length compared with non-inoculated plants (Dhanushkodi et al., 2013). Especially, Hallobacillus sp. SL3 and Bacillus halodenitrificans PU62 bacteria increased more than 90% in root length and 17.4% in dry weight compared to non-inoculated wheat seedlings in 320 mM NaCl salinity level which represented a significant reduction in the adverse effects of sodium chloride. This study showed that the use of halotolerant bacteria can act as a bio-inoculant in saline soil conditions (Dhanushkodi et al., 2013). The family Bacillaceae, which belongs to the phylum Firmicutes, class Bacilli and order Bacillales comprises 15 genera that include halophilic or haloalkaliphilic, aerobic endospore-forming species isolated from soil or sediment samples. These genera are Alkalibacillus, Bacillus, Gracilibacillus, Filobacillus, Halalkalibacillus, Halobacillus, Lentibacillus, Ornithinibacillus, Paraliobacillus, Salirhabdus, Salsuginibacillus, Tenuibacillus, Terribacillus, Thalassobacillus and Virgibacillus. Bacilluses produce ammonia from protein analysis and widely spread in nature. Most of them are mesophiles but some of them are psychrophiles, thermophiles, halophiles and alkaliphiles (Marquez et al., 2011). Irrigated lands in Iran are approximately eight million hectares and about 90% of agricultural production is produced on them, 6.6 million hectares of them are saline soils, 4.5 million hectares have only salinity limitation, while 2.5 million hectares also have other soil-related restrictions (texture, depth, flow coefficient, alkalinity, and permeability), erosion, topography and groundwater limitations in addition to the salinity stress. Twenty percent of Khorasan Razavi province soils have high salinity and alkalinity limitations because they have been located on irrigated agricultural lands or near them. Soil salinization is also increasing rapidly due to weather condition and agricultural management. Therefore, the sample sites for bacteria isolation were selected from these areas. 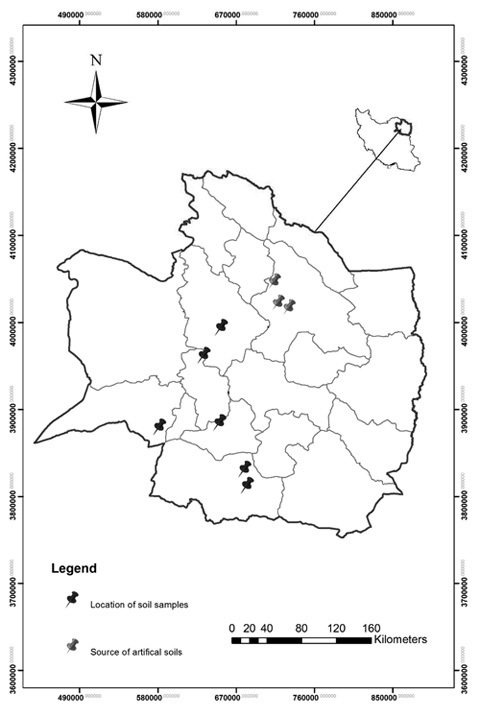 This study was conducted to identify and isolate native halophilic, alkaliphilic and haloalkaliphilic bacterial strains isolated from different soils of Khorasan Razavi province (Iran) and then the plant growth promoting characteristics, including ammonia, 3-indole acetic acid and ACC deaminase were measured on them. Afterward, the performance of each group of bacteria was investigated in the greenhouse conditions to reduce damage caused by salt stress on wheat (Triticum aestivum L.) resistant cultivar (Bam) to soil salinity. Finally, the genetic identification of all three halophilic, alkaliphilic and haloalkaliphilic native isolates that could decrease the effects of salinity and alkalinity stress for wheat plants was done through 16S rRNA gene sequencing. In order to isolate halophilic, alkaliphilic and haloalkaliphilic native isolates, soil sampling was carried out on six different Khorasan Razavi saline soils from 0-25 cm soil depth (Figure 1). Then samples were transferred to the laboratory in sterile tubes with area recording by GPS less than 48 hours. The samples were kept at 4 °C during this interval and then were stored at this temperature in the laboratory. Isolation and purification of each halophilic, alkaliphilic and haloalkaliphilic isolates from soil samples was done by their specific medium culture. For isolation, a 1:1 soil: water suspension (one gram of soil to 1 ml of sterile distilled water) was prepared. Five hundred micro-liter (500 µL) of this suspension was spread on the specific agar media culture. Medium cultures were incubated in the proper temperature (35 to 37 °C) for 3 to 7 days depending on the type of microorganisms. Fifteen halophilic isolates by Ventosa et al. (1982) medium, nineteen alkaliphilic isolates by Horikoshi (2006) and fourteen haloalkaliphilic isolates by a specific medium culture (Jones et al., 1992) were isolated, respectively. To ensure the purity of the isolates, bacteria were sub-cultured several times. Purified isolates were preserved by a liquid nitrogen method for long time preservation (Horikoshi, 1999). For nitrogen preservation of purified isolates, 10% glycerol was added to 20 ml of fresh liquid medium of each isolates and after thorough mixing, one milliliter part of it was transferred to 1.5 ml Eppendorf tube and was placed in the freezer at -80 °C for one hour. Finally, after this period, the samples were transferred into the freezer at -20 °C for long-term preservation. Plant growth promoting characteristics including, the concentration of ammonia by the modified Nesslerization method (Heonsang et al., 2013), 3-indole acetic acid concentration in the isolates and their replicates by the modified Salkowski method (Glickmann and Dessaux, 1995; Gutierrez et al., 2009) and ACC deaminase enzyme activity was measured by Penrose and Glick (2003) assay and it is the modified method of Honma and Shimonura (1978). These characteristics were measured in all 48 isolates. Two superior isolates of each group which had the highest production were selected based on the obtained results of the PGP characterizations of 48 isolates in the laboratory. Then, these six isolates were tested in the vicinity of Bam -salinity resistant cultivar wheat- under greenhouse conditions. To prepare the planting beds, three soils with different locations and properties that are mentioned in Figure 1 and Table 1 were selected. Artificial soils (Table 1) were prepared according to the characterization of isolates. Artificial soils were made by mixing three different soils with different ratios.
? The planting soil bed for halophilic bacteria inoculation was made by combining Sand River, Shir hesar soil and common soil with 1:1/2:3/2 ratio. ? The alkaliphilices’ planting bed was made by Sand River, Shir hesar soil and common soil with 1:1/4:7/4 ratio.
? The ratio for haloalkaliphilices’ planting bed preparation was 1:1:1 of the Sand River, Shir hesar soil and common soil. After soil preparation and suitable cultivar selection, nine boxes for halophilic group (two superior isolates and their control in three replications) and the same number for alkaliphilic and haloalkaliphilic groups (totally 27 boxes) with 30 × 40 × 30 cm dimension were filled with three different artificial soils (Table 1). For seed inoculation with these bacteria, selected isolates were sub-cultured in their specific culture media at first, twenty wheat seeds were then added to each Erlenmeyer flask as one replicate of each treatment containing fresh specific media. The control treatment only contained specific medium for each group of isolates without its bacterium. All of them were kept for two hours at room temperature. Then, 540 wheat seeds of Bam resistant cultivar which were inoculated with isolates were planted in triplicate (three boxes). In each box, twenty seeds were planted in two furrow line with 5 cm distance of adjacent seed as furrow method. The planted seeds were coated with 1 mm of sand. In order to avoid washing of bacterial isolates by irrigation process, the cultivation in the soil boxes was done in the wet soil and the boxes were irrigated before cultivation. After 20 days of sowing, seedlings per box were decreased to 10 numbers. The plants were irrigated based on net irrigation water requirement (NIWR) (it was calculated as 2990 m3 of water per hectare by Netwat software) and no leaching occurred on the boxes during the growth period. Also based on PGP, characterization measurements were carried out in the laboratory to study the isolates effects on wheat yield in the vicinity of seedlings, no chemical fertilizer or animal consumption was used during the growth period. During the growth period of plants, all cultural practices such as irrigation, etc. was performed. Pesticides spraying was only carried out to combat green aphid by metasystox toxin at two parts per thousand concentration once. Finally, after the physiological maturity (six months), all plants were harvested from boxes, and some parameters such as yield and yield components, including the number of plant per box, the number of ear per box, the mean number of ear per plant, mean plant height, mean ear length, mean pedicel length, total fresh shoot weight, total weight of the ear, total fresh root weight and their dry weights, grain yield per box, 1000 grain weight, biological index, etc. were determined. The statistical analysis designed for the experiment was completely randomized design (CRD) with three replicates. The parameters of yield and yield components were analyzed using the MSTAT-C software and mean comparison of data was compared with Multiple Dunkan Test in 5% level. Finally, definitive identification of superior isolates was performed by molecular biotechnology (16S rRNA gene sequencing). Genomic DNA extraction was done by Leach et al. (1990) method with minor variations. The fresh suspensions of bacteria were prepared at first and it was centrifuged at 6000 rpm for 5 minutes. The deposition was dissolved in 700 µl extraction buffer (including 1.4 M NaCl, 100 mM Tris-HCl and 20 mM EDTA with pH =8) and it became vortex for 30 seconds. Thirty micro-liter of SDS 20% and 50 µl of lysozyme (by volume 20 mg ml-1) were added and kept for 40 minutes at 65 °C. Equal to a quarter of the total volume of suspension, a mixture of chloroform isoamyl alcohol (at a ratio of 1:24) was added to it and centrifuged for 15 min at 13400 rpm. Upper phase was transferred to a new micro tube and as much as two-thirds of the volume of cold isopropanol was added to it and was centrifuged for 10 min at 13400 rpm. DNA precipitate was washed with 70% ethanol, air-dried and dissolved in 100 µl sterilized distilled water and the solution was stored at -20 °C. Genomic DNA extraction and amplification of 16S rRNA gene was confirmed by agarose gel electrophoresis. To amplify 16S rRNA gene from genomic DNA, the PCR device model (T100 Thermal Cycler) company BIO RAD-USA was used. Further identification of the isolates was performed by amplification and sequencing of 16S rRNA. For this purpose, universal primers 16S rRNA including, 27F with the 5'-AGAGTTTGATCMTGGCTCAG-3' sequence, 1492R with 5'- GGTTACCTTGTTACGACT T-3', 8fd with 5'- AGAGTTTGATCCTGGCTCAG-3' and 1488R with 5'- CGGTTACCTTGTTACGACTTCACC-3' sequence and polymerase chain reaction were used (Soto-Padilla et al., 2013). In order to carry out 16S rRNA gene amplification, polymerase chain reaction buffer at a concentration of 2 X Taq Pre Mix, sweep primers each with a concentration of 1 µl and DNA template with 2 µl concentrations were used. To perform polymerase chain reaction, the sample was similar to the other samples conditions in which distilled water for injection was replaced with the DNA template on it which was used as a negative control. Amplification conditions included: initial denaturation at 95 °C for 5 min, 30 cycles of denaturing at 95 °C for 60 s, annealing at 57 °C for 60 s, and primer extension at 72 °C for 60 s. A final elongation step for 7 min at 72 °C completed the amplification. The final product of the polymerase chain reaction was sequenced using deoxy nucleotide chain termination by Macrogen South Korea. The results were edited using Chromas Pro editing software and by the BLAST software were compared with valid records sequence in the database of National Center for Biotechnology Information (NCBI) (Chun et al., 2007). The phylogenic relationship of the isolates was determined by comparing the sequencing data with the related 16S rRNA gene sequences in the GenBank database of the National Center for Biotechnology Information, via BLAST search. Based on the results of plant growth promoting characteristics measurement in the laboratory, six top-producing isolates were H7, H1, A11, A7, HA6 and HA1. The amount of ammonia, 3-indole acetic acid and ACC deaminase for these six isolates have been mentioned in Table 2. The PGP characteristics results for other isolates is not mentioned here so as to prevent word prolongation. Comparison of the two top H1 and H7 isolates showed no significant difference with the control in the parameters including, the number of plants per box, mean pedicel length and mean length between the first node and pedicel (Table 3). The number of ears per box, the mean number of ears per plant, mean plant height, mean ear length, total dry weight of stem and root moisture content were significant in both isolates compared to the control, but no significant difference was observed between the two isolates (Table 3). Maximum fresh weight of shoots, ears and stems (Table 3), was observed in H1, H7 and in the control, respectively with significant differences to each other (P≤0.05). The amount of this increase was 56.2 and 42% for total fresh shoot weight, 44.3 and 38.5% for the fresh ear weight and 67.7 and 47% for the stem fresh weight in H1 and H7, respectively compared to control (Table 3). Maximum total dry shoot weight, grain yield per box and total dry ear weight per box was observed in H7 and H1 isolates with significant difference to each other and with the control. Grain yield per box showed 28.6 and 12.71% increase in H7 and H1 compared to the control, respectively (Table 3). The amount of shoot, ear and stem moisture content and total fresh root weight per box only had significant difference in H1 isolate compared to the control that this increase was 17.46% for the total root fresh weight in H1 compared to the control (Table 3). One thousand (1000) grain weight only was significant in H7 with 13.41% increase compared to the control. Comparison of root to shoot ratio (R/S) showed a decreased trend equal to -86.6% and -78.4% for H1 and H7, respectively compared to the control (Table 3). Maximum number of ears per box, total fresh and dry shoot weight, grain yield per box, total fresh and dry weight of ear per box, total fresh and dry weight of stem per box were observed in A11 and A7 with significant difference together with the control (Table 4). This increase was equal to 68.5% and 64.3% for the total fresh shoot weight, 56.5% and 28.9% for the grain yield per box, 62.5% and 58.8% for the total fresh weight of ear per box and 76.7% and 72.4 % in fresh stem weight for the A11 and A7 isolates compared to the control (Table 4). The mean plant height, the mean ear length and the mean pedicel length were maximum in A11 isolate, but the difference between A7 and the control was not significant (Table 4). Significant differences between the two isolates and the control did not show the parameters including, the mean length between the first node and pedicel, stem and root moisture content, the total fresh and dry weight of root per box and 1000 grain weight (Table 4). The root to shoot ratio (R/S) was observed without any significant difference and -216.1 and -197.0 % decrease to the control for the A11 and A7, respectively (Table 4). The most number of ears per box, total dry shoot weight, grain yield per box, total fresh and dry weight of ear per box and total fresh and dry root weight per box were observed in HA6 and HA1 with significant difference together and with the control (Table 5). This increase was equal to 69.8% and 46.7% for the grain yield per box, 70.9% and 66.7% for the total fresh weight of ear per box, 90.1% and 84.7% for the total fresh root weight in HA6 and HA1 compared to the control, respectively (Table 5). The mean number of ear per box, the mean plant height, the mean ear length, the mean pedicel length, mean length between the first node and pedicel, moisture percent of root and stem did not show any significant difference among HA6, HA1 and the control (Table 5). Total fresh shoot weight and total fresh and dry stem weight were higher in HA6 and HA1 isolates compared to the control, but no significant difference (P≤0.05) was observed between the two isolates. The total fresh shoot weight increased by 70.88 and 68.84% for HA6 and HA1, respectively compared to the control. The 1000 grain yield was higher in the two isolates than in the control, but this increase was only significant for HA1 isolate with 11.2%. The root to shoot ratio (R/S) showed significant increase of 65.8% and 51.7% for HA6 and HA1 isolates, respectively compared to the control (Table 5). On the average, the total fresh weight of shoots, ears and stems in plants inoculated with selected halophilic strains was about two times higher than non-inoculated plants. The grain yield per box and 1000 grain yield indicated about 30 and 15% increase, respectively with superior halophilic strains inoculation (Table 3). Increase in weights of different plant organs was observed under the effect of H1 strain, while H7 strain increased grain yield and its weight (Table 3). Wagar et al. (2004) in the bacterial containing ACC deaminase enzyme inoculation study on growth and wheat yield found that bacteria containing the enzyme significantly increased grain and straw yield, root length and weight, number of tillers and the amount of nitrogen, phosphorus and potassium in grain and straw compared to the control. They recognized that all these effects were due to the reduction of ACC ethylene level in plant. They also announced that the enzyme activity was different in the various isolates (Wagar et al., 2004). Overall, shoot growth was higher than root growth which may be due to the direct contact of the root with high salinity in the soil. Higher plant cells are usually in direct contact with the soil solution in plasma membranes and skin epidermal stem cells. Plant cell membranes can be directly damaged by high sodium ion (Leopold and Willing, 1984). Although, halophilic Virgibacillus bacterium strain H1 could increase root weight by 17.5% compared to the control, but the R/S ratio decreased compared to the control (Table 3) under the effect of both strains inoculation. Consequently, these bacteria did not affect root growth and development that much. Researchers (Gallegos-Cedillo et al., 2016) implied that increase in rhizosphere salinity caused a volume xylem flow reduction due to decreasing transport as a result of long distance from root to shoot. In a study of 130 rhizosphere bacteria isolated from wheat rhizosphere in a saline soil and PGPA characteristics in the different salinity levels (of 2, 4, 6 and 8%), it was observed that 24 bacteria were resistant to 8% salinity. Although all of them produced IAA, with increase in salt concentration the IAA production was reduced in the isolates (Upadhyay et al., 2009). Ten isolates were inorganic phosphate solubilizing bacteria, eight isolates produced siderophore and six isolates were gibberellin producers. However, only three isolates produced ACC deaminase (Upadhyay et al., 2009). The study of their genetic diversity showed that the strains belonged to the genus Bacillus and genera was derived from it. Among the 24 isolates, only two strains had capability of nitrogen fixation (NifH gene) including SU18 (Enterobacter sp.) and SU48 (Upadhyayet al., 2009). Yield and different weights of plant organs in the inoculated plants with alkalophilic strains increased to about 60% compared to non-inoculated plants (Table 4). Selected alkalophilic strains did not affect root system development like as halophilic strains. (Table 4). The alkaliphile halotolerant Planococcus rifietoensis bacteria was IAA producer (264 µg/ml), the mineral phosphate solubilizing (16.7 µg/ml) had ACC deaminase activity (using ACC as a source of nitrogen in 100 to 300 mM NaCl salinity) and thus, it had the potential to improve wheat growth (Rajput et al., 2013). Inoculation with this bacteria increased 37% growth of wheat under salt stress. It caused 63% dissolution of calcium phosphate and up to 60% of ACC deaminase activity in the presence of ACC (Rajput et al., 2013). Mohite (2013) explained optimization of indole acetic acid production by rhizospheric soil IAA producing bacteria which was carried out at different cultural conditions of pH and temperature with varying media components such as carbon and nitrogen source and tryptophan concentration. He suggested the IAA producing bacteria as efficient biofertilizer inoculants to promote plant growth (Mohite, 2013). Inoculation of free living diazotrophic bacteria and Cunninghamella elegans (fungi chitosan) on cowpea nodulation caused soil pH reduction, total N, available P and K increase in soil. Also, it increased cowpea nodules biomass, shoot biomass, and total N, P, and K in the shoots (Berger et al., 2013). Haloalkaliphilic bacteria Alkalibacillus haloalkaliphilus strain HA6 and Virgibacillus marismortui strain HA1 increased wheat yield, but their inoculation did not show any significant effect on yield parameters. Haloalkaliphilic inoculated plants represented about more than 70% increase compared to non-inoculated plants approximately in all studied parameters (Table 5). Haloalkaliphilic PGPR strains isolated from Gujarat soil in India, including, Bacillus pumilus and Pseudomonas pseudoalcaligenes could decrease the effect of salinity on paddy saline rice (Orayza sativa) cultivation (Jha and Subramanian, 2011). These bacteria increased 16% germination, more than 8% viability, 27 and 31% increase in dry weight and plant height. Also, rice inoculated with haloalkaliphilic PGPR strains increased 26% nitrogen, 16% phosphorous and 31% potassium concentration in the plant while the sodium and calcium concentration decreased in plant by about 71% and 36%, respectively under salinity stress (Jha and Subramanian, 2011). 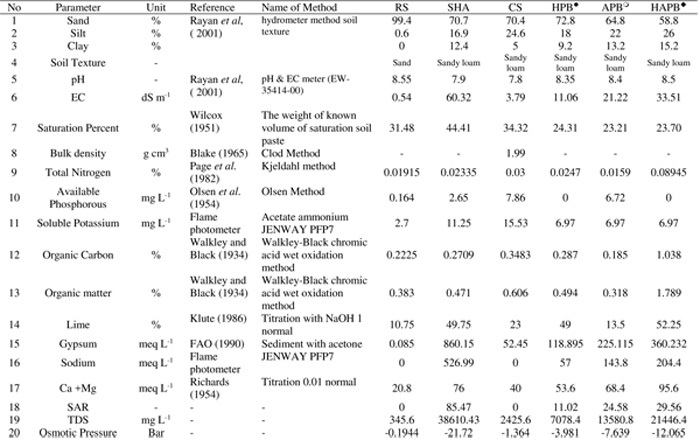 Unlike halophilic and alkaliphilic strains, the superior haloalkaliphilic strains promote root growth and development increased (Table 5) which represented their multi extremophilic strains advantages in high limitation of soil salinity (EC=33.5 dS m-1) and soil alkalinity (SAR=29.5) conditions (Table 1). The R/S ratio for both haloalkaliphilic strains had increasing trend compared to the control (Table 5), while the comparison of this ratio in the two other groups strains with their controls has decreased trend (Table 3 and 4). Inoculation of two haloalkalitolorant (RH5 and RH2) strains to bean and wheat in pot experiment and in a saline and alkaline condition indicated that both strains increased wheat plant height, dry shoot weight, ear length and grain weight per plant compared with the control plants (Rifat et al.,2013). RH5 strain was superior between the two strains as it affected most of the plant height (77 cm), the ear length (8.86 cm), dry shoot weight (4.42 grams per plant) and grain weight (6.17 grams) in wheat. Significant growth and grain production for bean plants was shown by inoculating the strains in sterile soil, especially RH5 compared to the control (Rifat et al., 2013). In a study on salinity and alkalinity stress reduction by six rhizosphere bacterial strains which had the ability to produce high IAA, (Soleimani et al., 2016). Five of them which had the capability of ACC deaminase production, were collected from the rhizosphere of wheat in saline and alkaline soil, it was shown that the ability of IAA and ACC production in high salinity decreased. However, two bacterial strains (Arthrobacter siccitolerans IRAN1 and Bacillus simplex UT1) in high salinity (5 to 40 dS m-1) and alkalinity (SAR=10-30) condition maintained their ability of IAA and ACC deaminase production (Soleimani et al., 2016) similar to the results of this study (Table 5). These bacteria significantly increased aerial dry matter (ADM) between 12 to 22% compared to non-inoculated plants, increased root dry matter (RDM) between 16 to 30% and increased the relative water content (RWC) in wheat under salt stress. Reduction in the plant proline amount and increase in the amount of catalase and peroxidase enzymes was significantly affected by inoculation in wheat plants. In fact, increase in the concentration of osmolytes (proline) in plants under stress conditions led to the destruction of some vital processes in plants such as metabolic processes based on nitrogen which caused it, though the stress can be reduced in the plants. IAA and ACC producing bacteria reduced ethylene production and increased potassium concentration, respectively. The K+/Na+ ratio in the aerial part of the wheat also increased after bacterial inoculation. The researchers announced that the selected bacteria improved sodium stress in wheat by increasing the relative humidity in plants and ion homeostasis (Soleimani et al., 2016) similar to our results which was visible in shoot and root moisture contents. Five selected isolates had the ability to dissolve Ca3 (PO2)-2 and three of them had the ability to dissolve KAlSiO3. All five isolates dissolved ZnO and four of them produced siderophore that increased the concentration of phosphate, potassium, zinc and iron in the soil and plant (Soleimani et al., 2016). The use of nitrogen-fixing haloalkaliphilic bacteria had improved the growth of plants and plant dry weight in saline conditions (4% NaCl) and pH=10.5 (Butale et al., 2010). Therefore, their usage as soil amendments in saline and alkaline soils (Butale et al., 2010) was suggested, which was similar to the results of this study. During the study of Pseudomonas moraviensis and Bacillus cereus as PGPR bacteria from rhizosphere soil of halophytic weed (Cenchrus ciliaris L.) of Khewra salt range on soil health and physiology of wheat, it was shown that their inoculation significantly increased organic matter, P, K, Ca, and NO3-N availability of soil (Ul Hassan and Bano, 2015). The wheat inoculation of these PGPR positively enhanced growth and physiology of treated plants (Ul Hassan and Bano, 2015). In general, the results showed that the halophilic, alkaliphilic and haloalkaliphilic bacteria had the potential to improve wheat growth due to PGP characteristics. The multi extremophilic bacteria (haloalkaliphilic) had stronger mechanisms to deal with salinity and alkalinity stress as higher root-to-shoot growth regulation alleviates the detrimental effects of salinity and alkalinity. Also, our plants, even under high saline and alkaline treatments managed to maintain the water content by inoculation with extremophilic bacteria. These results suggested that halophilic, alkaliphilic and haloalkaliphilic bacteria can be used as a strong bio-inoculant in the case where other rhizosporic microorganisms do not have the ability to survive. Siadat, H., Sadat. S. 1998. The growth and production of wheat in saline conditions on farms farmers. Soil and Water Journal. 12.